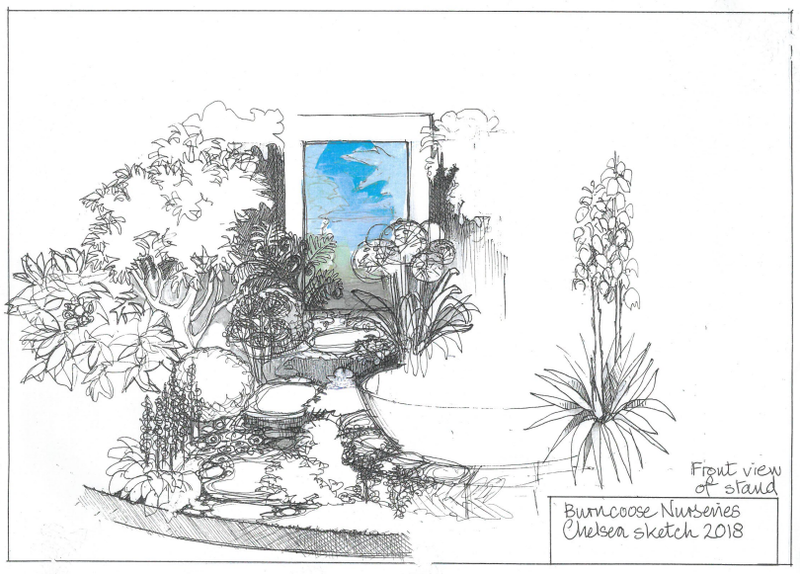 This year our Chelsea Theme is based on the way the gardens in Cornwall are shaped by the landscape and history. In addition to this our stand celebrates that at times the garden does not end at the boundary line, but takes in the larger picture that is the surrounding landscape. The Cornish landscape provides a particularly picturesque backdrop to the garden with its rolling hills, valleys, creeks, rivers, and awe inspiring seascapes. To replicate this, our stand will have at its centre, providing the backdrop to our planting, a tall glass sculpture enriched with colours that emulate those found in the Cornish landscape. Part of the idea of our stand is that when walking around it there will be different views of a garden set in a different part of the Cornish landscape, and the types of garden replicated are those typically found in Cornwall. The garden at the Minack Theatre at Porthcurno has been an inspiration for the coastal part of the stand. While much of the Cornish coastline is rightly protected for conservation, the Minack Theatre and its garden has been sculpted out of the cliff and creatively filled with exotic plants to create a breathtaking setting and experience. Another section of the stand will then be filled with plants that would certainly be found in a garden set in an old Cornish estate. Caerhays and Burncoose are the inspiration here with the Williams’ family connection to mining, which enabled them to become involved in the plant hunting expeditions. The legacy of this can be seen in the gardens filled with introductions from India and China. Like the gardens, Burncoose Nursery has been shaped by the history of the surrounding area and the landscape. This year our stand at Chelsea will be a homage to this.